"What happens if you give a thousand Motorola Zoom tablet PCs to Ethiopian kids who have never even seen a printed word? Within five months, they'll start teaching themselves English while circumventing the security on your OS to customize settings and activate disabled hardware." Michael Howard said something years back that stuck with me - programming is human against compiler, much easier than security which is human against human. "We left the boxes in the village. Closed. Taped shut. No instruction, no human being. I thought, the kids will play with the boxes! Within four minutes, one kid not only opened the box, but found the on/off switch. He'd never seen an on/off switch. He powered it up. Within five days, they were using 47 apps per child per day. Within two weeks, they were singing ABC songs [in English] in the village. And within five months, they had hacked Android. Some idiot in our organization or in the Media Lab had disabled the camera! And they figured out it had a camera, and they hacked Android." What it does show from a security perspective though is the limitation of what we can reasonably expect from any access control. Humans with time and determination will find their way around, whatever you're basing your access control scheme on (TLS, Kerberos, SAML, ...) you have to assume it will fail eventually (and not in a good way as in this story) and factor in how the system as a whole survives. Today's mobile app stores, like Apple's App Store (via iTunes), review the software in their stores before the public can download them. That curation process, however, is not without its limitations -- and as software developers, we absolutely must not ever rely on the curation process to spot security defects in our apps. Much has been said about Apple's own App Store, both good and bad. Whatever your preference, their App Store has undoubtedly the most rigorous app review process in the mobile app store business, such as it is. Developers are required to conform with their guidelines in order for their apps to get approved and become available for consumers to purchase. But even that rigorous review is not in any way intended to be a security review of your apps. Make no mistake about it, Apple is not in the business of ensuring your app is secure. So then, what do they do? Let's explore a bit -- with the understanding that I have no inside knowledge at Apple, and I'm basing this on my observations and readings. Stability. They verify the app loads and runs as described. Functionality. Does the app perform the advertised functionality? Play by the rules. Does the app conform to Apple's published API standards? More to the point, is your app using any unpublished APIs, which is perhaps the biggest no-no on the app store. Policies. Does the app conform to Apple's policies (good, bad, or otherwise)? Now, I admit that the above is probably a gross over-simplification of what they actually do. I'd expect they load the app in a controlled test environment. I'd expect they run the app using some profilers and such to look for memory leaks and that sort of implementation faux pas. But, by and large, if your app conforms to their published APIs and their policies, it's good to go. Local storage of sensitive data. As long as your app uses published APIs for file input/output, you can store whatever you want to, however you want to. Want to put your users' credentials into a plaintext SQLite database? No problem. Secure communications. Again, use published APIs (e.g., NSURL) and the app will fly right on through the review process, irrespective of whether you use SSL to encrypt the network data. Want to send your users' username/password credentials in a JSON bundle to your server's RESTful interface, without any encryption at all? No problem. Authentication to back-end services. Published APIs, blah blah blah... Want to authenticate your users against a locally stored username and hashed password? No problem. Session management on back-end services. Want to use easily guessable, sequential numbers for your users' sessions? No problem. Data input validation. Want to allow untrusted data in and out of your app, without ensuring they're safe from SQL injection, Cross-site scripting, etc? No problem. Data output encoding/escaping. Want to pull some data from a database and send it straight to a UIWebView without encoding it for the output context? No problem. To Apple's defense, reviewing an app for the sorts of things I've listed here takes a high level of knowledge of the app itself, the business function it provides, the sorts of data it handles, etc. These are things that cannot and must not be performed by a team with no knowledge of the app, like an app store review process. No, to review an app for common shortcomings like these must be done by someone with deep knowledge of the app. That should happen within the app development team, perhaps with support from an external team to perform some rigorous security testing. No matter how it's done, the reviewers simply must understand the app and its business. Without that knowledge, no review can be adequate. We'll discuss ideas for how to do reviews like these -- and prevent the security flaws in the first place -- at our Mobile App Sec Triathlon in San Jose, California on 5-7 November. Join us and let's discuss. If there is one thing that's crystal clear in Infosec its that Infosec lags software innovation. Its a field where we are always playing catch up and the important question tends to be - how fast can we catch up? Because innovation outpaces security, Infosec has been a passive bystander shuffling debt issuances around like someone processing subprime mortgages and rating it Triple A when the first payment cannot even be made. The industry ships apps everyday with substandard access control that do not reliably authenticate or authorize users, much less deal actively malicious actors. Technical debt measures the necessary work that does not get shipped in a release. Taking on too much debt is like borrowing too much money, it might work but once things begin to go against you its hard to recover because you are not in a position of strength. As Warren Buffett says, "You don't know who is swimming naked until the tide goes out." Its important to note that Technical debt for security is not a passive thing, there are people actively looking to find and exploit your Technical debt. The reason why playing catch up is not good enough in Mobile is one that will be familiar to my clients - the Mobile Use Cases are too important to screw up. The security industry skated by the whole history of the Web on a security architecture past its sell by date, but at first it did not matter. Go way back to the mid 90s, what kind of apps were being deployed? Mostly brochureware. It took years to get to dynamic, data driven sites, and then years to get to profitable, transactional sites (pets.com anyone?). Point being - early Web was cool as hell, but it was a giant science project followed by a hype bubble. The fact that Infosec did not move quickly enough to deal with the security issues was too bad, but at the same time not a systemic failure because the arly Web Use Cases were low risk brochureware. Most companies just dipped their toe in the water, and security incrementally figured out how to deal with SQL Injection, XSS, and so on in an iterative process. But there was time to do this in most cases. The first generation Mobile Use Cases are most certainly not dipping toes in water, they are diving in head first (and perhaps a lifeguard may not be present)! Doctors with iPads, brokerage applications, and pretty much the whole remote work force pinging your mainframe from who knows where. This has the makings of a bad cycle of events for security. Infosec is used to playing catch up because the technology moves fast but the business will take awhile to roll things out. Not in Mobile, the backend hooks are largely already there, just need to find the right Web services to call and write an iOS and Android front and dive right in the deep end. Wait and see what happens is not good enough any more, Infosec needs to act now and get in front of the Mobile security issues. Take a hard look at the Use Cases you are deploying on Mobile, this is 1.0 technology running High Risk Use Cases, your Mobile Security architecture and implementation cannot be patch and pray. Mind the Gap: Compare the risk level of what's being deployed to the robustness and assurance of your mobile security. Its time to invest: learning ways towards building a more resilient security foundation. How do you secure your iOS apps' network connections? Is it sufficient to simply use HTTPS in an NSURL object? The short answer is it depends. For sure, some recent attacks have eroded the trust we can place in the venerable SSL or TLS standards, but we're also not ready to just throw them out either. That should provide you with basic protection against eavesdropping (and a few other network nasties) quickly and easily. But is it enough? To understand that, let's consider a bit more what actually happens in an SSL protected network socket. When iOS (via NSURL) sees an SSL certificate from a server, it verifies two things: 1) is the certificate signed by a root certificate authority (CA), and 2) does the server's name (via DNS) match the name presented in the SSL certificate? Now, that combination might sound adequate, but there is actually a loophole or two remaining. A sufficiently resourced adversary with access to the soft under belly of DNS as well as access to one or more CAs can still trick your app into accepting a connection you wouldn't otherwise want. In an extreme case, this could result from a successful man in the middle (MITM) attack. So, for some cases, we might want to do more than just SSL. We might, for example, want to verify that a specific CA signed the server key. We might want to check that it is precisely the right server key that has been presented, using "certificate pinning". Each of these things is achievable, but they require us to dig deeper than just using USURL with an HTTPS URL. They also have pros and cons -- cert pinning, for example, isn't going to work with many network proxies that a lot of corporate LANs require. We'll discuss these options, along with code examples, at our Mobile App Sec Triathlon in November. Hope to see you there, ready to discuss so you can best understand what course of action is best for your app and its users. This is the fourth in a series of posts focused on building an Android Security toolkit. So far we have looked at access control services and defensive coding, which are necessary for the Mobile app. but no Mobile app is an island. Mobile apps can have lots of communication channels, such as SMS, NFC, and GPS. If used, each of these presents the enterprise a new set of challenges to deal with, protocols and threat models that the enterprise security team likely has not worked in depth with before. On top of that, the Mobile app usually needs to connect back to the enterprise or Cloud via Web Services. Many enterprise mobile projects begin by saying something like "we have web apps and we have web services, this is nothing more than sticking that little sucker (the mobile client) as a new front end and we are done." Thinking that a mobile app is no different from supportin, say, Firefox is to miss the core of mobile. I have seen this repeatedly and it leads you down the wrong path. Some of the differences include that mobile devices are ot connected per session (like a web app), they are occassionaly connected and those connections drop. This leads to caching and other usability enhancers. You can expect that a mobile middle tier (not just another front end on existing portals) will be required to manage optimizations and resolving sessions, cache and routes. On top of that, the enterprise is in a position of delivering not just data, but delivering code to the device. Its no longer a case of riding the rails of Chrome, IE or Firefox. The enterprise is now in the business of packaging, deploying and testing client software. The communication between the Mobile app and the Mobile Web service requires layers of protection. Even the basics here, like access control, are fraught with challenges. 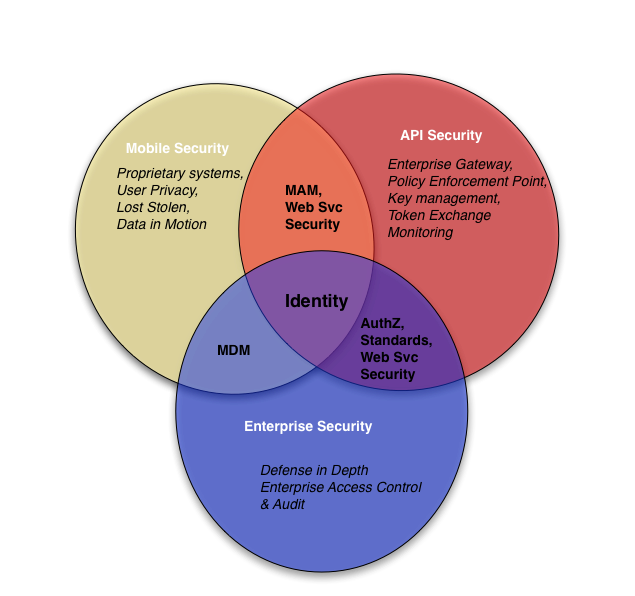 To navigate the Venn of Mobile Security, look outside the device. How will the device be manageed? How is access controlled when calling the Web services? What identity is used? How are the Web services protected? How is it authorized on the server side? These services are crucial to enabling the mobile app to work in a real enterprise deployment. The requirements are not all platform specific but they all create platform specific requriements for the Android developer to deal with. Think End to End. Write an app of any intrinsic value (either in user data, transactions, or whatever), and someone is going to attack it. It's 2012, after all, and I'm sure no one reading this will in any way be surprised to hear that there are computer miscreants out there who are going to attack apps of value. The thing is, though, it's been my experience that many times the very people who write the apps themselves fail to sufficiently understand and internalize just how the attacks will happen. Sure, we've all read about various hacks, but to many people, those are nothing more than abstract thoughts. When it comes to understanding how someone will attack your work, however, it becomes real. So let's consider that a bit. Do you think your attacker will install and run your app to try to learn how it works? Sure, that's a given, right? Do you think your attacker will work his/her way through all the views and data fields in your app, and perhaps try various dictionaries of the big bad boys (e.g., SQL Injection, Cross-Site Scripting (XSS)) and so on? Sure, that too is a given, right? Even if those attacks aren't in any way relevant to the technologies in your app, they're going to try them anyway. Do you think your attacker will look through all the files in your app's sandbox (e.g., its ~/Documents folder), looking for potentially damning information like a user ID, password, or session token in a .plist file? Yup. Plenty of tools make that one real easy too. Do you think your attacker will configure a network proxy to intercept all of your app's communications to/from its server(s), looking for login credentials, session tokens, etc.? Oh yeah, still well in the realm of feasibility here. For that matter, do you think an attacker will load your app on a jailbroken device, put it into a debugger, and single step through it, looking for crypto keys and other sensitive data? Ruh roh, indeed! Do you think an attacker will try to tamper with the Objective C runtime by intercepting messages to/from the various objects in your app? Do you think an attacker will attempt to inject messages into your app in that debugging session, and get your app to misbehave? That list can continue on and on for quite some time. I wrote it in order of increasing attack complexity and difficulty, but every one of these things is achievable today using tools and techniques available to any attacker. This list isn't science fiction or "Hollywood" in any way. The question you should be asking is whether an attacker would go to this level of difficulty to attack your application. Well, that depends on the potential gain and the likelihood of being caught, among other things. And on the point of getting caught, your attacker has all the advantages and you all the disadvantages. Every one of these attacks can be done in the safety and comfort of the attacker's "laboratory", with pretty much zero chance of being caught. What you're left with then is what is the potential gain to the attacker, and that's not something I can answer for you. What can you do about it? I'll address that in Part 2 of this blog entry within the next few days. And, of course, Gunnar (@OneRaindrop) and I (@KRvW) will be talking about issues like this at our Mobile App Security Triathlon in November. So then, what would you think if I told you the file system and every file on an iOS solid state disk (NAND flash storage) is encrypted using hardware-based AES-256? Your first impression might be pretty favorable. However, the disk itself (and its HFS journal) is encrypted with one key (the EMF! key), and then the vast majority of files are encrypted with another key (the Dkey) -- and these two keys are stored on the NAND in plain sight in Block 1 (PLOG). D'oh! No worries, you say -- your device is locked using a passcode. So there! Well, it turns out that an attacker with physical access to your device can put it into DFU mode (Device Firmware Upgrade -- although I admit I thought it meant something else when I first learned about it) and boot via USB cable using a RAMdisk, easily created on a Mac using Xcode. Once booted, the attacker can access and steal all those files that are encrypted using the Dkey. To be fair, not every file on an iOS device is encrypted using the Dkey. Notable exceptions to this are the user's email, and any file created by an app where "Complete" file protection is used. The device's keychain database also isn't quite as easy to to decrypt. Most of those exceptions are encrypted using a key that is derived from the device's Unique IDentifier (UID) and the user's passcode. On the vast majority of consumers' iOS devices, that passcode is a 4-digit PIN. Not to worry, the good folks at Sogeti have provided us with a set of tools that can, among other things, brute force guess all 10,000 PINs and then decrypt most of the rest of the data. Sounds pretty grim, doesn't it? For more reading on this, see Jonathan Zdziarski's excellent book "Hacking and Securing iOS Applications: Stealing Data, Hijacking Data, and How to Prevent It". As a consumer, there are a few things you can do. As an enterprise, you can deploy a Mobile Device Management (MDM) solution and, among other things, enforce strong passcodes and such. But, as a developer, you're not so lucky. As a developer, you cannot assume your customers will be smart enough to use a strong passcode. No, developers must assume the lowest common denominator in order to protect their customers' data adequately. And remember, the OWASP Mobile Security Project ranks a lost or stolen device as the number one risk faced by mobile consumers. That means that for information exceeding simple consumer grade sensitive data, you must not rely on Apple's built-in file protections to protect your customers' data. There are a few alternatives, of course. We can make use of Apple's CCCrypt Library and make use of all that crypto hardware ourselves -- and stay in control of the crypto keys ourselves. (See Apple's sample CryptoExercise code for an example of how to do this -- it's a bit dated, but you'll get the basics.) We can also use third party libraries like SQLcipher to create encrypted databases where, once again, we control the crypto keys ourselves. The common denominator in both of these approaches is control of the crypto keys. It's also the toughest (by far) problem to solve in using cryptography securely. We'll be discussing these options, of course, at our upcoming Mobile App Sec Triathlon in San Jose, California, on 5-7 November. We hope you'll come join us, and let's discuss different approaches to tackling this enormously important and difficult problem. In the last two posts, we explored what goes into building an Android Security Toolkit, these are tools that developers can apply to minimize the amount of vulnerabilities in their Android app and, because no app is perfect, to lessen the impact of those that remain. So far we focused on access control, which helps to establish the "rules of the game" authentication and authorization controls who is allowed to use the app and what they are allowed to do. If you read the Android Security documentation, access control concepts dominate, but this is only part of the security story. Access control enforces the rules for customers, employees, and users who are effectively trying to get work done; however access control does little to mitigate threats of people deliberately trying to break the system. It pays dividends to learn and apply access control services because a vulnerability here will cascade across the system and be available to attackers as well, but it pays to go further just access control in your mobile security design and development. I usually describe this situation as - I would bet a lot of money that I can beat both Garry Kasparov and Michael Jordan in a game. The way I would do this of course is to play Kasparov at basketball and Jordan at chess. This is what attackers do, they change the rules of the game or change the game entirely. So while access control gives us the According to Hoyle security rules that the app would like to play under, the attacker makes no such assumption, the asserted rules are the beginning of the game not the end. All security is built on assumptions, when these fails so does the access control model. For example, as we discussed in the last blog the Android access control policies are enforced in the kernel so the assumption is that the kernel hasn't been directly or indirectly subverted. So if an app cannot be secured by access control alone, what's an Android developer to do? The requirements for access control are fairly straightforward on first pass - who is allowed to use the app and what are they allowed to do? Sure, it gets more complex from there, but the start and even endgame are fairly clear. What's the starting point (much less endgame) in defensive coding? Threat models like STRIDE make an excellent starting point for finding requirements. Identify the key threats in the system and what countermeasures can be used to deal with them. STRIDE recommends, and I concur that data flow analysis is a practical way to begin modeling your application to discover where threat and vulnerabilities lie. From there, refining the model with App attack surface - data, communications, and application methods, plus Mobile specific attack surface - GPS, NFC, SMS, MMS - adds more detail to both identify vulnerabilities and locate countermeasures. The mindset of the Defensive Coder is fundamentally different than the access control mindset. The Defensive coder assumes compromise attempts and possible success at each layer in the stack. This includes standard techniques such as input validation, output encoding, audit logging, integrity checking, and hardening Service interfaces applied to local data storage, query and update interfaces, interaction with Intents and Broadcasts. Not just publishing these resources for use, but factoring in how they may be misused. How is the app resilient to attempts to crash it, an attacker impersonating a legitimate user, a malicious app with backdoors running on the device, or attempts to steal or update data? The Threat Model cannot answer all these questions completely but it does lead the development effort in the right direction to finding ways to build margins of safety into the app. Screenshots. Every time you (or your app's users) press the home key while they are running your app, the default behavior in iOS causes a screenshot to be made and stored in plain view on the device. Cut-n-paste. Anything you put in the cut-n-paste buffer is readily accessible from any app. Face it, the feature wouldn't be so useful if you couldn't move data around. The bad news is that all of these things can result in leaked information. The good news is that they're under the app developer's control. We'll of course discuss solutions to these and other issues at our Mobile App Sec Triathlon, including a coding lab where you'll implement fixes to these problems. But also know that sometimes APIs don't behave entirely as we might expect. If you're a developer, no doubt you're duly shocked to hear this news, right? Well, I encountered one such API inconsistency recently while working on the OWASP iGoat tool -- which we'll also use extensively at the #MobAppSecTri. Allow me to explain. A few of us on the iGoat project have been working on a new exercise for iGoat. The exercise is supposed to illustrate the dangers of the keystroke cache used by the spell checker, as I explained above. Only, we've encountered some inconsistent behavior in how iOS treats this data. And, when we're finished with them, we're releasing both fields. All of this is as per Apple's API for UITextFields. Now here's the strange part. When we run the exercise with both of these fields "protected", we find the first one (subjectField) is protected just fine, but the second one (messageField) shows up in the spell checker cache (located in ~/Library/Keyboard/dynamic-text.dat in the iPhone simulator). Huh, that seemed odd. So, like any scientifically inclined geeks, we tried dozens of experiments to figure out why things were behaving this way. Eventually, we added a third field in exactly the same way as the first two. Sure enough, the first two fields are protected, but now the last (dummy) field goes into the cache. Our next step, which we haven't yet done, is to test this on a hardware device, but my point here is pretty straight forward. Sometimes APIs misbehave. And, there's a security lesson to be drawn from this. If we'd done a code review of this app, we may well have concluded that all was fine (with regard to this issue). But that wouldn't have been enough. It's also vital to test these security assumptions during the testing phase. This type of issue is ideally suited for dynamic validation testing. Take your security assumptions and dynamically observe and verify them in a test bed. Surely, that would have (and did, in our case!) shown that there's still a problem. Adding a third (dummy) field resolves only the symptoms of this problem, not the problem itself. The jury is still out on that one, but we won't rest until we've resolved it, one way or the other. In the past few months, we've seen the publication of several highly useful texts on different topics related to mobile app security. We thought we'd start a small annotated bibliography here to point to the really useful stuff. It's not intended to be comprehensive, but these are documents that we've found to be exceptionally useful. If you've found some that are not on this list, please feel free to submit them to us; if we agree, we'll add them to the bibliography. So, here's our list for iOS. We'll be building an Android version shortly, and quite likely a General MobAppSec version as well. "iOS Security", May 2012, Apple, Inc. -- Say whatever you want about Apple's security practices. This guide provides a superb description of iOS's security architecture, from its boot process through all of the app-level protections provided by current iOS versions. This is a must read for anyone involved in iOS application development. "Hacking and Security iOS Applications - Stealing Data, Hacking Software, and How to Prevent It", January 2012, Jonathan Zdziarski. -- Although it is largely focused on forensic analysis of iOS devices, this book is another absolute must read for iOS developers. In it, you'll learn how jailbreaking works, how to copy the contents of an iOS device's hard drive, how iOS encryption works in detail, among many other things. It includes several labs for the reader to work through, along with available source code for each. "Security Configuration Recommendations for Apple iOS 5 Devices", March 2012, U.S. National Security Agency. -- Although more aimed at IT Security than MobAppSec audiences, this document provides some useful tips on how to configure iOS 5 devices and how to manage them in large enterprise environments. "iOS Hardening Configuration Guide - For iPod Touch, iPad, and iPhone running iOS 5.1 or higher", March 2012, Australian Department of Defence. -- Conceptually similar to the NSA guide above (but written in Australian English :-), this useful document provides useful security configuration tips for iOS deployments. It also goes into good detail on how the platform's security features work, and is worthwhile reading for everyone involved in iOS application development. When it comes to application security, mobile app sec ("MobAppSec" as we like to call it) seems to be getting some pretty abysmal scores. What makes this especially risky business is that we're more and more putting real apps where real money (or other valuable information) is being put in harm's way. Two studies were released this week, which together are useful at understanding the bigger picture when it comes to MobAppSec. The first is the fourth release of the venerable Building Security In Maturity Model (BSIMM) by Gary McGraw, Brian Chess, and Sammy Migues. Next, there's the fourth annual World Quality Report from consulting firm, Capgemini. The BSIMM study collects and analysis observations from some 51 software development organizations across 12 industry verticals. In all, some 111 security activities are observed. It paints a rather thorough picture of what software developers around the world are doing with regards to software security. Although it's missing efficacy measurements -- to be fair, it doesn't set out to measure the efficacy of the activities observed -- it is easy to draw the conclusion that software development has come a long way in the last few years, at least in terms of security practices. Since the launch of the BSIMM in 2008, for example, the software security groups (SSGs) in major software development organizations have flourished, rising from 1 SSG employee per 100 developers to 2 SSG employees per 100 developers. And it appears the limiting factor in staffing SSG organizations is finding qualified employees. This speaks well for the future of software security in large enterprises, to be sure. The WQR concludes that firms are failing at mobile application security. The MobApp communities seem, to be driven by more of a gold rush mentality, focusing on functionality and time-to-market. While focusing first and foremost on functionality is completely appropriate for a business, doing that at the expense of security can result in unforeseen security consequences. For example, while iOS 6 is brand new in the hands of consumers, there are already reports of things like Siri allowing an attacker to send Facebook postings and tweets, even on a locked device. No doubt the security research community will be taking a far deeper dive into finding all the abuse cases that can be found in the new iOS 6 user interfaces, among other things. The majority of BSIMM participants know that developing secure software requires attention to details throughout the development process, from inception through production and maintenance. MobApp developers would be well advised to learn from these things sooner than later. There's an old adage that a smart person learns from his mistakes, but a wise person learns from others' mistakes. We'll help bring these things together at our upcoming Mobile App Sec Triathlon, of course. We'll talk about many of the things observed in the BSIMM study, and we'll help put those concepts into actionable steps that developers can immediately put into practice. We hope to see you there. In the last post, we started building out an Android Security Toolkit, things every Android developer should know about security. Access control is fundamental to application security. In my perfect world, when a developer learns a new language they first learn Hello World, the next thing a developer learns should be how to implement who are you and what can you do in the langauge - authentication and authorization. The AndroidManifest.xml file describes the access control policy that forms the application boundary, but where is this boundary enforced and what services does it provide? The user is able to confirm or deny installation (but not change permissions) based on the AndroidManifest.xml file, this defines step 1 above. The policy is distributed with the application so policy management is under control of the distribution point such as AppMarket. This leaves step 2, enforcing access control policy. Android apps run in the Dalvik VM, however IPC is not managed in the VM, instead its managed further down in the stack in the Binder IPC Driver which resides in the Linux kernel. Not sure, but I suspect the reason is that there are a number of permissions that requires lower level access. The binder maps the permission and either the caller's identity or binder reference to verify access privileges. From a design standpoint, permission boundaries can be defined and enforced at different layers in the App including Content Provider, Service, Activity, and Broadcast Receivers. Access control is the beginning of thinking about security but its not the endgame, the next step to building an Android security toolkit is defensive coding, how to deal with cases like code injection that are designed to subvert the access control scheme. This is somewhat of a follow-up to my posting yesterday re what iOS devs should know about security-relevant changes to iOS 6. We've all known for some time that Apple would be deprecating the use of Universal Device IDentifiers (UDIDs) in apps. We've also known more recently that attackers have been targeting those UDIDs. And now, we need to prep our apps because, as of iOS 6, the use of UDIDs is no longer available. (Actually, reports indicate that Apple has been rejecting UDID-using apps for at least a couple months already.) But in iOS 6, Apple gives app developers an alternative in the form of a so-called "Advertising Identifier". So, the question you might be asking yourself is this: Since this issue relates mostly to advertising, why do we care from a security perspective, and what's the big deal with UDIDs anyway? Glad you asked. For starters, UDIDs are persistent identifiers. Many app developers have used UDIDs to identify sessions between mobile apps and servers. After all, they're unique identifiers, right? There are a couple of problems with that approach. First of all, if a consumer sells his iPhone, the UDID remains with the device, even if the iPhone gets wiped with a factory reset. Secondly, there are privacy concerns over associating users and persistent hardware identifiers. And besides, even if we mistakenly thought using UDIDs was a good thing, Apple has taken that option off the table. That leaves us, at the very least, with the new advertising identifier. It isn't associated with the hardware, and can be cleaned with a factory reset, so many of the privacy concerns are reduced. But let's step back a bit and consider this from a security perspective. If we're looking for a session tracking token, why wouldn't we generate a new one with every session, similar to how JSESSIONID works on Java web apps? If we're identifying a user, why not use a username and/or user number of some sort? Isn't then the advertising identifier simply an issue for the advertisers to deal with (as the name would imply)? I believe so. But the fact remains that many apps have used UDIDs for session tokens, user identifiers, etc., for some time. Those apps will need to be re-tooled, if they haven't already been. I consider the use of something like a UDID to simply be sloppy coding, and we need to do better than that. We'll discuss using the advertising identifier and other approaches at our Mobile App Security Triathlon in San Jose, on November 5-7. Ken van Wyk asks mobile developers - what's in your bag of tricks? From a security perspective Ken lists a number of critical things for developers to protect their app, their data and their users; these include protecting secrets in tranist and at rest, server connection, authentication, authorization, input validation and out put encoding. These are all fundamental to building a secure mobile app. Over the next few posts, I will address the core security issues from an Android standpoint and what security tools shold be in every Android developer's tookit. So onwards to policy for Identity and Access Control, a good place to start is with AndroidManifest.xml. AndroidManifest.xml provides the authoritative source for package name and unique identifier for the application, this effectively bootstraps the apps' activities, intents, intent filters, services, broadcast receivers, and content providers. These show the externaly interfaces available for the application. The next step is assigning permissions. Android takes a bold stance by publishing the permissions that the app requests before its installed. This has the positive effect of letting the user know what they are permitting, but at the same time the user cannot change or limit the app. If they want to play Angry Birds (and who doesn't?) they choose to install Angry Brids with the permissions set by the developer or they choose to live an Angry Birds-free existence. So the overall effect is to inform the user but not let the user choose granular permissions (this last has the positive effect of not turning the average user into a system adminisrator for a tiny Linux box). Every program and every user of the system should operate using the least set of privileges necessary to complete the job. Primarily, this principle limits the damage that can result from an accident or error. It also reduces the number of potential interactions among privileged programs to the minimum for correct operation, so that unintentional, unwanted, or improper uses of privilege are less likely to occur. Thus, if a question arises related to misuse of a privilege, the number of programs that must be audited is minimized. Put another way, if a mechanism can provide "firewalls," the principle of least privilege provides a rationale for where to install the firewalls. The military security rule of "need-to-know" is an example of this principle. Notice the two facets of this principle. The first is the conservative assumption to limit the damage of accident and error. This margin of safety approach should be near and dear to every engineer's heart. The second part of the principle is simiplicity - if its not needed turn it off, or in this case do not publish or request access to it. From a security point of view, the AndroidManifest file helps to reduce your applications' attack surface. If you don't need SMS or Internet or Wifi, don't ask for it. Android has a pretty interesting approach to access control from some under involvement to declarative permission to capabilities, and we will dig deeper into this in the next post. Is your mobile app ready for legalized Wi-Fi sniffing? Sure, we've all known about network sniffing for many years, right? We've also known that sniffing a network we don't own is illegal--or was illegal anyway. But now that a US Federal judge has ruled sniffing an open, public wireless network to be legal, it's a different game. Insecure transport layer protection is a kind way of saying that mobile developers often times don't adequately protect their apps' secrets while in transit. When we fail to encrypt things that matter -- e.g., authentication credentials, session tokens, device identifiers, user data, geolocation data -- we expose our users to what I like to refer to as a "coffee shop attack". Prior to that court ruling, the coffee shop attack was illegal. Of course, criminals weren't much deterred by that, but at least the victim might have some legal recourse if an attacker's action was itself illegal. No more. The gloves, as they say in ice hockey, are off. Of course, those of us who understand the technologies involved wouldn't dream of using an open Wi-Fi without first encapsulating all of our network traffic inside a strong VPN tunnel (if at all). Well, the average consumer can't even spell VPN, folks. Assuming our users will use a VPN is simply not adequate. So what does that mean for mobile app developers? How do we protect our consumers from (now legal) network sniffing? For starters, we have to design and implement our apps under the assumption that our users will be using the apps in a hostile network environment, like an open Wi-Fi in a coffee shop. If your app can't withstand the scrutiny of running securely on an open Wi-Fi, you have no business using the word "secure" to describe it in any way. That's all easy to say, of course, but how does it translate into Gunnar's "what do I do?" sort of action? Make an inventory of all the sensitive data in your app, from the low level (e.g., user authentication) stuff through the high level (e.g., user data). Make it a security requirement that all such sensitive data will be protected while at rest as well as while in transit, whenever possible. Ensure that all network connections where sensitive data is to pass are strongly encrypted (e.g., SSL, perhaps with certificate pinning or other strong certificate verification). Verify through code reviews that all sensitive data is encrypted in transit. Validate through dynamic validation testing that all sensitive data is in fact (not just in theory) encrypted in transit. I know the above list is an over simplification in many ways, but our consumers are not likely to easily forgive us for an "oops" when it comes to exposing their sensitive data to a coffee shop attacker. Securing network data is just one of many things we need to do, of course. But it's a biggie. Building security into our apps is a lot like physical fitness in that way. We don't just go for a jog the day after New Year's Eve because we feel guilty about how much we consumed over the holidays. It's a lifestyle change. It's a discipline. We need to think about it all the time and live it. In our upcoming Mobile App Sec Triathlon, Gunnar and I will cover these topics, of course -- right down to code examples of how to implement the above list. We hope to see plenty of mobile app devs there, and to engage in meaningful dialog about different ways of approaching this and many other issues regarding secure mobile apps. The first part, mostly, makes sense. Training developers is not an instantaneous fix, to be sure. In my training for developers we look at concrete ways for developers and security people to improve their overall security in their apps. The ways to do this vary, some are short term design/dev fixes (improving input validation for example) and some are longer term (swapping out access control schemes). There is some latency from the time you train developers til the time you realize all the benefits in your production builds. However, unless you roll code at a glacial pace, I do not believe it takes 18 months for training to pay off. Should happen way faster. The second part of the tweet boils down to the old adage - "what if you train them and they leave?" The counter argument to this is simple and serious - "what if you don't train them and they stay?" Believe me I have seen plenty of the latter and lack of clue does not age well. So while I agree with the spirit (but not timetable) of the first part of the tweet, I definitely disagree with the second part of the tweet. We need more training, better educated developers and security people, not less. Specifically, we need hands on security engineering skills - the basic principles of security are not rocket science, the challenge is all in how do you apply it in the real world? Despite increasing budgets, the security industry has not solved many problems in the last decade, but one thing the industry absolutely excels at is - conferences! 900 - NINE HUNDRED - Infosec conferences! This is not a record to be proud. Granted there are a handful of very good conferences, but the security industry's conference problem is that the industry as a whole is geared to talking not doing. We've all seen the conference hamster wheel - oh big problems, oh solutions that seems hard, when is beer? You get on the plane home with the same problems (or more) than you left with. Repeat. Many years ago, I was working on a project at a large company with thousands of developers, and they wanted to tackle software security. The company put its top architect on the project, a software guy not a security guy. We met early on the project, he was very talented one of the better architects I have worked with, and like is the case with all such people was very curious, he really wanted to learn. He asked me - how do I get up to speed on security matters? I told him to read Michael Howard's books, Gary McGraw's books and Ross Anderson's books. I came back a month or two later, to his credit he had plowed through, they were piled up behind him. He looked at me seriously and asked - "I see where the problems are, but what do I do about them?" The what do I do question has haunted me ever since. We got down and worked on a plan for this company, but the industry as a whole glamorizes the oh so awful security problems at conferences but leaps over the what do I do part. This is where training comes in. I am not naive enough to believe training is all we need to do, but I definitely believe that education for security people, architects and developers has a major role to play in improving our collective situation. We need better tools and technologies, advances in vulnerability assessment tools, identity and access management, these have all helped a lot over the decade, we need better processes on how to apply them in real world systems, your SDL matters. But so do your people! Without basic training you won't know what tools to use and where, how to apply them and what traps to avoid. This is why we train. Ken and I will be in San Jose, Nov 5-7 doing three days of training on Mobile AppSec. If you or your dev teams are doing work on iOS, Android, or Mobile, there is a lot to talk about. The focus is hands on, what problems are out there in mobile today and what to do about them. The first time I went to Black Hat, I was intrigued and impressed by the depth of FX's and other presentations, but I was also horrified. There was simply no one in the software world (at that time) talking about this stuff, it was clear the problems would just keep getting worse and they did. But enumerating problems decade plus later is not good enough, we need time materials, resources and people on what to do about them - how to fix. Out of 900 conferences, there is no equivalent "how to fix" conference that is akin to Black Hat. If you plant ice, you're gonna harvest wind. By the way, waiting to deal with problems is a proven way to fail, and there is nothing more permanent than a temporary solution. Ken and I started on Mobile because now is the chance, the initial mobile deployments for many enterprises, to get it in right, with some forethought on security. The last thing we need is more hand waving, bla bla and power point at a conference on "the problem" we need to get busy engineering better stuff, and that is where training comes in. As the USMC says the more you sweat in training, the less you bleed in battle. You might ask - with so many problems, can we really engineer our way out? Let me ask then - if we had 900 cons a year on how to build better stuff would be better off or worse? Security always lags technology. In the early days of the Web, the security was egregious. But this did not matter so much because the early websites were brochureware. The security industry had time to catch up (though still behind) and learned over time how to deal with SQL Injection et al. In Mobile its much worse. The security industry is behind the technology rate of change as always, the developers are untrained, but the initial use cases for Mobile are not low risk brochureware, they are high risk mobile transactions, Banking, and customer facing functionality. Security's window to act on building better Mobile App Sec for high risk use cases is not 3 years away, its now. In yesterday's launch of the new Kindle, Amazon CEO Jeff Bezos said some interesting things about today's smart phones and tablets. In particular, his point about customers not wanting "gadgets" but wanting services that improve over time really hit home for me. I've been an "early adopter" for many years. I had an Apple Newton (MP-120, MP-130, and MP-2000) and loved them. More recently, I've been searching for 10+ years for the right smart phone for my needs. I had an old Linux-based Motorola A-780 and really wanted to believe that someone had finally built the right device for me. Its list of features was right on target (for 2003 or so). But it failed me miserably. I also tried a Blackberry 8800, but it too was just a box of silicon features with crappy software, IMHO. Total #FAIL. Finally, I felt I found what I was looking for when I got my first iPhone. And, by and large, I did. I'm now a few iPhones down that path (on a 4S now, but that'll change in a week or so), and I'm a pretty happy customer. Of course, there are many lessons to be learned in all of this. How about security, and how does this all relate to mobile app developers? Excellent question. It's 2012, and few people would disagree that smart phones have become hugely important to a vast number of consumers. We're doing things on our devices today that we would have laughed at the day before the iPhone (or Android!) was released. The mobile phone world has been flipped onto its head, thanks to these pioneers. But it's not about a competition of feature lists. To succeed in today's market, the device has to just work, and has to just work for non tech-savvy consumers. It has to pass the Uncle Bill and Aunt Betty test. Apple long ago learned to de-emphasize the technical specifications race, and focus on the "user experience". When they release a new product, the focus of their announcements is showing us how things work, not the CPU speed of the new multi-core processor. Although those things are important, they're not what matters to our consumers. Because, guess what -- today's consumers don't understand the technology (by and large), and they surely don't understand security. Security, like the functionality in our devices, has to just work. And those two words, "just work", have to be something that we all live and breathe. Force a user to install a root CA certificate into the /var/blah/blah/blah folder and you've already lost. But make it "just work" and do it securely, and you've won. Security too cannot be an after thought. We have to consider security at every possible stage of our work. It has to simply be a quality of our efforts. Mr. Bezos is right in that regard. It can't be about building a product with all the latest buzzwords included in the ingredient list. It has to be about making our users happy. One of the things that will keep our users happy is to enable them to securely do all the cool things that today's (and next week's) devices can do. Security must simply be an intrinsic quality of our software. Are you prepared? In our Mobile App Sec Triathlon, Gunnar (@OneRaindrop) and I (@KRvW) will give you plenty of food for thought, and discussion. Come join us in San Jose this 5-7 November and let's talk about what needs to be done.